"CCTV" redirects here. For the state television broadcaster of the People's Republic of China, see China Central Television. For other uses, see CCTV (disambiguation). 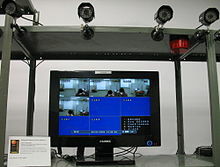 In industrial plants, CCTV equipment may be used to observe parts of a process from a central control room, for example when the environment is not suitable for humans. CCTV systems may operate continuously or only as required to monitor a particular event. A more advanced form of CCTV, utilizing digital video recorders (DVRs), provides recording for possibly many years, with a variety of quality and performance options and extra features (such as motion detection and email alerts). More recently, decentralized IP cameras, perhaps equipped with megapixel sensors, support recording directly to network-attached storage devices, or internal flash for completely stand-alone operation. Desk in one of the regional control-rooms of the National Police in the Netherlands in 2017. CCTV control-room monitor wall for 176 open-street cameras in 2017. The earliest video surveillance systems involved constant monitoring because there was no way to record and store information. The development of reel-to-reel media enabled the recording of surveillance footage. These systems required magnetic tapes to be changed manually, which was a time consuming, expensive and unreliable process, with the operator having to manually thread the tape from the tape reel through the recorder onto an empty take-up reel. Due to these shortcomings, video surveillance was not widespread. VCR technology became available in the 1970s, making it easier to record and erase information, and the use of video surveillance became more common. During the 1990s, digital multiplexing was developed, allowing several cameras to record at once, as well as time lapse and motion-only recording. This increased savings of time and money which then led to an increase in the use of CCTV. Recently CCTV technology has been enhanced with a shift toward Internet-based products and systems, and other technological developments. Closed-circuit television was used as a form of pay-per-view theatre television for sports such as professional boxing and professional wrestling. Boxing telecasts were broadcast live to a select number of venues, mostly theaters, where viewers paid for tickets to watch the fight live. The first fight with a closed-circuit telecast was Joe Louis vs. Joe Walcott in 1948. Closed-circuit telecasts peaked in popularity with Muhammad Ali in the 1960s and 1970s, with "The Rumble in the Jungle" fight drawing 50 million CCTV viewers worldwide in 1974, and the "Thrilla in Manila" drawing 100 million CCTV viewers worldwide in 1975. In 1985, the WrestleMania I professional wrestling show was seen by over one million viewers with this scheme. As late as 1996, the Julio César Chávez vs. Oscar De La Hoya boxing fight had 750,000 viewers. Closed-circuit television was gradually replaced by pay-per-view home cable television in the 1980s and 1990s. 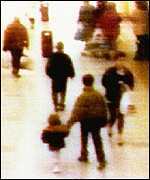 The two-year-old James Bulger being led away by his killers, recorded on shopping centre CCTV in 1993. This narrow-bandwidth television system had a low frame rate. The studies included in the meta-analysis used quasi-experimental evaluation designs that involve before-and-after measures of crime in experimental and control areas. However, several researchers have pointed to methodological problems associated with this research literature. First, researchers have argued that the British car park studies included in the meta-analysis cannot accurately control for the fact that CCTV was introduced simultaneously with a range of other security-related measures. Second, some have noted that, in many of the studies, there may be issues with selection bias since the introduction of CCTV was potentially endogenous to previous crime trends. In particular, the estimated effects may be biased if CCTV is introduced in response to crime trends. Another question in the effectiveness of CCTV for policing is around uptime of the system; in 2013 City of Philadelphia Auditor found that the $15M system was operational only 32% of the time. There is still much research to be done to determine the effectiveness of CCTV cameras on crime prevention before any conclusions can be drawn. A more open question is whether most CCTV is cost-effective. While low-quality domestic kits are cheap the professional installation and maintenance of high definition CCTV is expensive. Gill and Spriggs did a Cost-effectiveness analysis (CEA) of CCTV in crime prevention that showed little monetary saving with the installation of CCTV as most of the crimes prevented resulted in little monetary loss. Critics however noted that benefits of non-monetary value cannot be captured in a traditional Cost Effectiveness Analysis and were omitted from their study. A 2008 Report by UK Police Chiefs concluded that only 3% of crimes were solved by CCTV. In London, a Metropolitan Police report showed that in 2008 only one crime was solved per 1000 cameras. In some cases CCTV cameras have become a target of attacks themselves. Cities such as Manchester in the UK are using DVR-based technology to improve accessibility for crime prevention. In 2013 Oaxaca hired deaf police officers to lip read conversations to uncover criminal conspiracies. In Singapore, since 2012, thousands of CCTV cameras have helped deter loan sharks, nab litterbugs and stop illegal parking, according to government figures. In recent years, the use of body worn video cameras has been introduced for a number of uses. For example, as a new form of surveillance in law enforcement, with cameras located on a police officer's chest or head. The UK Highways Agency has a publicly owned CCTV network of over 3000 Pan-Tilt-Zoom cameras covering the British motorway and trunk road network. 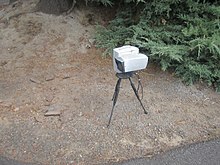 These cameras are primarily used to monitor traffic conditions and are not used as speed cameras. With the addition of fixed cameras for the active traffic management system, the number of cameras on the Highways Agency's CCTV network is likely to increase significantly over the next few years. The London congestion charge is enforced by cameras positioned at the boundaries of and inside the congestion charge zone, which automatically read the licence plates of cars. If the driver does not pay the charge then a fine will be imposed. Similar systems are being developed as a means of locating cars reported stolen. 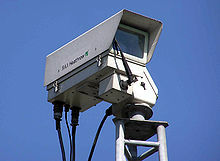 Other surveillance cameras serve as traffic enforcement cameras. A CCTV system may be installed where any example, on a Driver-only operated train CCTV cameras may allow the driver to confirm that people are clear of doors before closing them and starting the train. Many sporting events in the United States use CCTV inside the venue for fans to see the action while they are away from their seats. The cameras send the feed to a central control center where a producer selects feeds to send to the television monitors that fans can view. CCTV monitors for viewing the event by attendees are often placed in lounges, hallways, and restrooms. This use of CCTV is not used for surveillance purposes . Each of these operations is transmitted with a description, allowing detailed monitoring of all actions of the operator. Some systems allow the user to search for a specific event by time of occurrence and text description, and perform statistical evaluation of operator behaviour. This allows the software to predict deviations from the standard workflow and record only anomalous behaviour. In the United States, Britain, Australia and New Zealand, CCTV is widely used in schools due to its success in preventing bullying, vandalism, monitoring visitors and maintaining a record of evidence in the event of a crime. There are some restrictions on installation, with cameras not being installed in an area where there is a "reasonable expectation of privacy", such as bathrooms, gym locker areas and private offices (unless consent by the office occupant is given). Сameras are generally acceptable in hallways, parking lots, front offices where students, employees, and parents come and go, gymnasiums, cafeterias, supply rooms and classrooms. The installation of cameras in classrooms may be objected to by some teachers. Criminals may use surveillance cameras to monitor the public. For example, a hidden camera at an ATM can capture people's PINs as they are entered, without their knowledge. The devices are small enough not to be noticed, and are placed where they can monitor the keypad of the machine as people enter their PINs. Images may be transmitted wirelessly to the criminal. Even lawful surveillance cameras sometimes have their data go into the hands of people who have no legal right to receive it. CCTV systems are often used for security monitoring purposes in organizations and homes. A crowdsourced map of CCTV cameras near Grande Arche using OpenStreetMap data. Surveillance camera mounted on the walls of Rosenbad, one of the Swedish's government buildings in central Stockholm, which houses the Prime Minister's office. One of the parliament's (Riksdagen) building can be seen in the background. 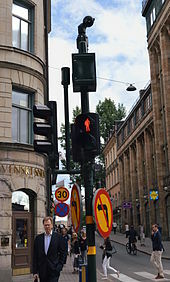 A surveillance camera, aimed at a public street (Kungsgatan) in Stockholm, Sweden, mounted on top of the pole. The headquarters of the United Nations in New York, with cameras visible on the side of the UN General Assembly building. About 65% of CCTV cameras in the world are installed in Asia. In Asia, different human activities attracted the use of surveillance camera systems and services, including but not limited to business and related industries, transportation, sports, and care for the environment. In 2018, China was reported to have a huge surveillance network of over 170 million CCTV cameras with 400 million new cameras expected be installed in the next three years, many of which use facial recognition technology. Surveillance camera mounted on a tripod in Sunriver, Oregon. In the United Kingdom, the vast majority of CCTV cameras are not operated by government bodies, but by private individuals or companies, especially to monitor the interiors of shops and businesses. 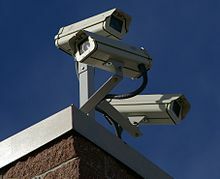 According to 2011 Freedom of Information Act requests, the total number of local government operated CCTV cameras was around 52,000 over the entirety of the UK. Although specific legalities of running a home CCTV system in the UK are rather vague there are published rules and regulations that although are mostly common sense, do include some laws that most people may not be aware of, including registering with ICO as a data controller if any CCTV camera catch images of any of the public on, or outside of your property. Defra made it legal in 2017 to have all Abbatoirs in the UK now covered by CCTV to prevent cruelty to animals during the slaughter process. Project SCRAM is a policing effort by the Halton Regional Police Service to register and help consumers understand the complex issues of privacy and safety that confront households when dealing with installations of home security systems. "The SCRAM program enables community members to voluntarily identify and register their residential video surveillance equipment through a simple, secure, confidential, online form." It has not been extended to commercial businesses. A wide-ranging effort to provide registration and monitoring of home security and systems. "Security camera registration and monitoring is a community-based crime prevention opportunity and investigative tool that enlists the help of residents and can help prevent crime on three levels. Residential video surveillance cameras can deter criminals from entering the area, can prevent crimes from occurring and help solve crimes by providing valuable evidence to the police." In South Africa due to the high crime rate CCTV surveillance is widely prevalent but the country has been slow to implement the latest technology e.g. 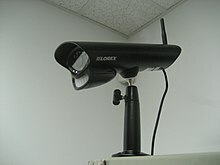 the first IP camera was released in 1996 by Axis Communications but IP cameras didn't arrive in South Africa till 2008. In order to regulate the number of suppliers in 2001 the Private Security Industry Regulation Act was passed requiring all security companies to be registered with the Private Security Industry Regulatory Authority (PSIRA). Material collected by surveillance cameras has been used as a tool in post-event forensics to identify tactics, techniques and perpetrators of terrorist attacks. Furthermore, there are various projects − such as INDECT − that aim to detect suspicious behaviours of individuals and crowds. It has been argued that terrorists won't be deterred by cameras, that terror attacks aren't really the subject of the current use of video surveillance and that terrorists might even see it as an extra channel for propaganda and publication of their acts. In Germany calls for extended video surveillance by the country's main political parties, SPD, CDU and CSU have been dismissed as "little more than a placebo for a subjective feeling of security". Many civil liberties campaign groups, academics and consultants have published research papers into CCTV systems. Opponents of CCTV point out the loss of privacy of people under surveillance, and the negative impact of surveillance on civil liberties. Furthermore, they argue that CCTV displaces crime, rather than reducing it. 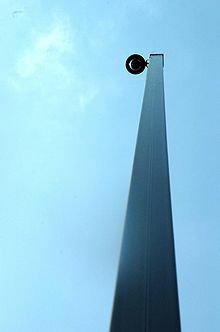 Critics often dub CCTV as "Big Brother surveillance", a reference to George Orwell's novel Nineteen Eighty-Four, which featured a two-way telescreen in every home through which The Party would monitor the populace. All countries in the European Union are signatories to the European Convention on Human Rights which protects individual rights including the right to privacy. The EU's Data Protection Directive regulates access to personal data including CCTV recordings. This directive is translated into the national law of each country within the European Union. In 2012, the UK government enacted the Protection of Freedoms Act which includes several provisions related to controlling and restricting the collection, storage, retention, and use of information about individuals. Under this Act, the Home Office published a code of practice in 2013 for the use of surveillance cameras by government and local authorities. The aim of the code is to help ensure their use is "characterised as surveillance by consent, and such consent on the part of the community must be informed consent and not assumed by a system operator. Surveillance by consent should be regarded as analogous to policing by consent." In Canada, the use of video surveillance has grown very rapidly. In Ontario, both the municipal and provincial versions of the Freedom of Information and Protection of Privacy Act outline very specific guidelines that control how images and information can be gathered by this method and or released. In Sweden, the use of CCTV in public spaces is nationally regulated; requiring permits for any public operator (incl. Swedish Police Authority) to install CCTV in spaces allowing access to the general public. In an opinion poll commissioned by Lund University in August 2017, the general public of Sweden were asked to choose one measure that would ensure their need for privacy when subject to CCTV-operation in public spaces. 43% favored regulation in the form of clear routines for managing, storing and distributing image material generated from surveillance cameras, 39% favored regulation in the form of clear signage informing that camera surveillance in public spaces is present, 2% favored regulation in the form of having permits restricting the use of surveillance cameras during certain times of day/week, 10% favored regulation in the form of having restrictive policies for issuing permits for surveillance cameras in public spaces. 6% were unsure or did not know. Video content analysis (VCA) is the capability of automatically analyzing video to detect and determine temporal events not based on a single image, but rather object classification. As such, it can be seen as the automated equivalent of the biological visual cortex. The combination of CCTV and facial recognition has been tried as a form of mass surveillance, but has been ineffective because of the low discriminating power of facial recognition technology and the very high number of false positives generated. This type of system has been proposed to compare faces at airports and seaports with those of suspected terrorists or other undesirable entrants. 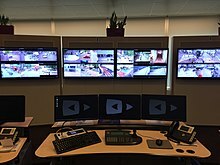 Computerized monitoring of CCTV images is under development, so that a human CCTV operator does not have to endlessly look at all the screens, allowing an operator to observe many more CCTV cameras. These systems do not observe people directly. Insta Types of body-movement behavior, or particular types of clothing or baggage. 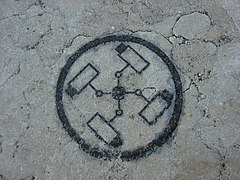 To many, the development of CCTV in public areas, linked to computer databases of people's pictures and identity, presents a serious breach of civil liberties. Conservative critics fear the possibility that one would no longer have anonymity in public places. Demonstrations or assemblies in public places could be affected as the state would be able to collate lists of those leading them, taking part, or even just talking with protesters in the street. Most CCTV systems may record and store digital video and images to a digital video recorder (DVR) or, in the case of IP cameras, directly to a server, either on-site or offsite. There is a cost in the retention of the images produced by CCTV systems. The amount and quality of data stored on storage media is subject to compression ratios, images stored per second, image size and is effected by the retention period of the videos or images. DVRs store images in a variety of proprietary file formats. Recordings may be retained for a preset amount of time and then automatically archived, overwritten or deleted, the period being determined by the organisation that generated them. However, an important feature of some CCTV systems is the ability to take high resolution images of the camera scene, e.g. on a time lapse or motion-detection basis. Images taken with a digital still camera often have higher resolution than those taken with some video cameras. Increasingly, low-cost high-resolution digital still cameras can also be used for CCTV purposes. A growing branch in CCTV is internet protocol cameras (IP cameras). It is estimated that 2014 was the first year that IP cameras outsold analog cameras. IP cameras use the Internet Protocol (IP) used by most Local Area Networks (LANs) to transmit video across data networks in digital form. IP can optionally be transmitted across the public internet, allowing users to view their cameras through any internet connection available through a computer or a phone, this is considered remote access. For professional or public infrastructure security applications, IP video is restricted to within a private network or VPN, or can be recorded onto a remote server. The city of Chicago operates a networked video surveillance system which combines CCTV video feeds of government agencies with those of the private sector, installed in city buses, businesses, public schools, subway stations, housing projects etc. Even homeowners are able to contribute footage. It is estimated to incorporate the video feeds of a total of 15,000 cameras. New York City has a similar network called the Domain Awareness System. London also has a network of CCTV systems that allows multiple authorities to view and control CCTV cameras in real time. The system allows authorities including the Metropolitan Police Service, Transport for London and a number of London boroughs to share CCTV images between them. It uses a network protocol called Television Network Protocol to allow access to many more cameras than each individual system owner could afford to run and maintain. The Glynn County Police Department uses a wireless mesh-networked system of portable battery-powered tripods for live megapixel video surveillance and central monitoring of tactical police situations. The systems can be used either on a stand-alone basis with secure communications to nearby police laptops, or within a larger mesh system with multiple tripods feeding video back to the command vehicle via wireless, and to police headquarters via 3G. Integrated systems allow different security systems, like CCTV, access control, intruder alarms and intercoms to operate together. For example, when an intruder alarm is activated, CCTV cameras covering the intrusion area are recorded at a higher frame rate and transmitted to an Alarm Receiving Centre. Many consumers are turning to wireless security cameras for home surveillance. Wireless cameras do not require a video cable for video/audio transmission, simply a cable for power. 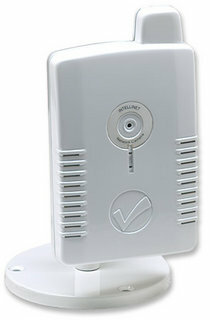 Wireless cameras are also easy and inexpensive to install, but lack the reliability of hard-wired cameras. Previous generations of wireless security cameras relied on analog technology; modern wireless cameras use digital technology which delivers crisper audio, sharper video, and a secure and interference-free signal. In Wiltshire, UK, 2003, a pilot scheme for what is now known as "Talking CCTV" was put into action; allowing operators of CCTV cameras to order offenders to stop what they were doing, ranging from ordering subjects to pick up their rubbish and put it in a bin to ordering groups of vandals to disperse. In 2005, Ray Mallon, the mayor and former senior police officer of Middlesbrough implemented "Talking CCTV" in his area. Other towns have had such cameras installed. In 2007 several of the devices were installed in Bridlington town centre, East Riding of Yorkshire. Due to the widespread implementation of surveillance cameras, glasses are being built which can defeat CCTV cameras. In December 2016 a form of anti-CCTV and facial recognition sunglasses called 'reflectacles' were invented by a custom-spectacle-craftsmen based in Chicago named Scott Urban. They reflect infrared and, optionally, visible light which makes the users face a white blur to cameras. The project easily surpassed its funding goal of $28,000 and reflectacles became commercially available in June 2017. Spraying substances over the lens can make the image too blurry to view. The security camera installation cost in Los Angeles, United States ranges from US$300 to US$3,500. On average, however, the cost can be anywhere from US$893 – US$2,267. The price will go up depending on specific requirements or the extent of the security that will be required. Among other factors, the specific type of camera being used has the most significant impact on its cost. The average cost of two digital cameras packaged with an LCD monitor is around US$450. Different brands can also have different prices. The type of technology used also has an impact of security camera installation cost. Wireless camera systems are generally more expensive than their wired counterparts. ^ Another estimate put the number at about 100 million worldwide in 2011. ^ Kumar, Vikas; Svensson, Jakob, eds. (2015). Promoting Social Change and Democracy Through Information Technology. IGI Global. p. 75. ISBN 9781466685031. ^ Dempsey, John S. (2008). Introduction to private security. Belmont, CA: Thomson Wadsworth. p. 78. ISBN 9780534558734. ^ "What's wrong with public video surveillance?". ACLU. Retrieved 5 January 2017. ^ "Surveillance Cameras and the Right to Privacy". CBS News. 13 August 2010. Retrieved 5 January 2017. ^ a b c "Rise of Surveillance Camera Installed Base Slows". 5 May 2016. Retrieved 5 January 2017. ^ Dornberger, Walter: V-2, Ballantine Books 1954, ASIN: B000P6L1ES, page 14. ^ "ET_SRB Cam FS.indd" (PDF). Retrieved 2009-07-22. ^ "Ecliptic Enterprises Corporation". Eclipticenterprises.com. Archived from the original on 5 July 2008. Retrieved 2009-05-08. ^ CCTV recording systems are still often used at modern launch sites to record the flight of the rockets, in order to find the possible causes of malfunctions, while larger rockets often send pictures of stage separation back to earth by radio link. ^ Kruegle, Herman (15 March 2011). CCTV Surveillance. ISBN 9780080468181. ^ "Internet based CCTV on cloud services" (in Finnish). fennoturvapalvelut. 27 March 2015. ^ a b Ezra, Michael (2013). The Economic Civil Rights Movement: African Americans and the Struggle for Economic Power. Routledge. p. 105. ISBN 9781136274756. ^ a b c "History of Prizefighting's Biggest Money Fights". Bloody Elbow. SB Nation. 24 August 2017. ^ "Zaire's fight promotion opens new gold mines". The Morning Herald. 18 November 1974. ^ "Wrestlemania In Photographs: 1-10". Sportskeeda. 1 April 2017. ^ "You're being watched, New York!". BBC. 11 March 2002. ^ Staff (August 2007). "CCTV". Borough Council of King's Lynn & West Norfolk. Archived from the original on 23 May 2009. Retrieved 2008-12-14. ^ a b "Public Area CCTV and Crime Prevention: An Updated Systematic Review and Meta-Analysis". Journalist's Resource.org. 11 February 2014. ^ Zehnder (2009). = "The economics of subjective security and camera surveillance" Check |url= value (help). ^ Priks, Mikael (1 November 2015). "The Effects of Surveillance Cameras on Crime: Evidence from the Stockholm Subway". The Economic Journal. 125 (588): F289–F305. doi:10.1111/ecoj.12327. ISSN 1468-0297. ^ Stutzer (2013). "Is camera surveillance an effective measure of counterterrorism?". Defence and Peace Economics. 24: 1–14. doi:10.1080/10242694.2011.650481. ^ Alexandrie, Gustav (2017). "Surveillance cameras and crime: a review of randomized and natural experiments". Journal of Scandinavian Studies in Criminology and Crime Prevention. 18 (2): 210–222. doi:10.1080/14043858.2017.1387410. ^ "Orphaned Video System in Philadelphia?". May 2015. ^ "National community Crime Prevention Programme" (PDF). Retrieved 2016-03-30. ^ a b Cite error: The named reference Assessing was invoked but never defined (see the help page). ^ Hughe, Mark (25 August 2009). "CCTV in the spotlight: one crime solved for every 1,000 cameras". Independent News and Media Limited. Retrieved 2009-08-27. ^ "Network of CCTV cameras proving effective". www.straitstimes.com. 8 March 2016. Retrieved 2017-02-06. ^ Bayley, David H.; Stenning, Philip C. (2016). Governing the Police: Experience in Six Democracies. Transaction Publishers. ISBN 978-1412862318. ^ Networx Security. "Closed Circuit Television." Retrieved 7 March 2019. ^ Kablenet, The Register. "TfL hands out contracts for congestion charge tags." 6 June 2008. Retrieved 7 March 2019. ^ Rowena Coetsee, Bay Area News Group. "New surveillance cameras doing their job, Antioch’s top cop says." 11 August 2017. Retrieved 8 March 2019. ^ Prof. Eugene Volokh, The Wall Street Journal. "Traffic Enforcement Cameras." 26 March 2002. Retrieved 8 March 2019. ^ "Using CCTV to monitor the workplace | Small Business Update | Library | ICAEW". www.icaew.com. Retrieved 2016-09-18. ^ ATL (22 October 2013). "Use of CCTV surveillance in schools". ATL the education union. Retrieved 8 November 2016. ^ Bruce McDougall and Katherine Danks (28 March 2012). "School security CCTV puts bullies on pause". The Daily Telegraph. Retrieved 8 November 2016. ^ "Legal aspects of the use of video cameras in schools =". ^ "Benalla. Trois policiers suspendus pour avoir transmis des images de vidéosurveillance". 20 July 2018. ^ Novak, Matt (26 June 2012). "Surgery, Security and Sales: The Future of Closed-Circuit Television". Smithsonian. ^ "Closed Circuit Television". The Museum of Broadcast Communications - Encyclopedia of Television -. Retrieved 1 July 2018. ^ "Recommendations and Guidelines for Using Closed-Circuit Television Security Systems in Commercial Institutions". Scientific Working Group on Imaging Technology (SWGIT). 8 June 2012. ^ khris78. "The CCTV Map". osmcamera. Archived from the original on 25 October 2014. Retrieved 2 August 2014. ^ "The Video Surveillance Industry – Market size" (PDF). Cameramanager.com citing other industry sources. Retrieved 7 February 2015. ^ "Australian state government to expand CCTV use across transport network". Archived from the original on 2 April 2015. Retrieved 2015-03-11. ^ "Chinese TV station CCTV provide 'old school' analysis of AFC Asian Cup match". Retrieved 2015-03-11. ^ "Indian state government uses CCTV to cut forest crimes". Archived from the original on 11 October 2014. Retrieved 2015-03-11. ^ "Smart cameras catch man in 60,000 crowd". BBC News. 13 April 2018. Retrieved 2018-04-13. ^ Technocreep : the surrender of privacy and the capitalization of intimacy. [S.l. ]: Greystone Books. 2014. p. 28. ISBN 978-1771641227 ; "Surveillance Society: New High-Tech Cameras Are Watching You". Popular Mechanics. 30 September 2009. Retrieved 31 October 2015 ; "Lawmakers want more surveillance on the ground -- and in the sky". NBC News. 20 April 2013. Retrieved 31 October 2015 ; Dempsey, John; Forst, Linda (2015). An Introduction to Policing. Cengage Learning. p. 485. ISBN 9781305544680. ^ "Public Video Surveillance: Is It An Effective Crime Prevention Tool?". California Research Bureau. June 1997. Retrieved 5 February 2015. The popularity of CCTV security systems has not gone unnoticed by the manufacturers of camera surveillance systems. ...A leading CCTV manufacturer reported net earnings of $120 million in 1995, compared with net earnings of $16 million the previous year. ...Over 50 percent of all CCTV surveillance equipment sales are to industrial and commercial clients. CCTV surveillance is also very common in the American workplace. ^ Minoli, Daniel (2013). Building the internet of things with IPv6 and MIPv6 the evolving world of M2M communications. New Jersey: Wiley. p. 86. ISBN 9781118647134. ^ "The great surveillance boom". Fortune. 26 April 2013. Retrieved 24 January 2016. ^ "Privacy Fears Grow as Cities Increase Surveillance". The New York Times. 13 October 2013. Retrieved 5 January 2017. ^ "Chicago's Camera Network Is Everywhere". Wall Street Journal. 17 November 2009. Retrieved 5 January 2017. ^ "Chicago Links Police, Private Cameras". WLS-TV. 2010. Retrieved 2010-08-16. ^ "Chicago's Video SURVEILLANCE CAMERAS: A PERVASIVE AND UNREGULATED THREAT TO OUR PRIVACY" (PDF). ACLU of Illinois. February 2011. Retrieved 5 January 2017. ^ "NYPD expands surveillance net to fight crime as well as terrorism". Reuters. 21 June 2013. Retrieved 31 October 2015. ^ "Lack of Video Slows Hunt for a Killer in the Subway". The New York Times. 29 March 2010. Retrieved 31 October 2015. ^ "The State Of Surveillance". Bloomberg Business. 7 August 2005. Retrieved 31 October 2015. ^ "The Building Has 1,000 Eyes". The New York Times. 4 October 2013. Retrieved 5 January 2017. ^ "30,000 Surveillance Cameras Monitor D.C.-Area Public Schools". NBC Washington. 1 January 2015. Retrieved 31 October 2015. 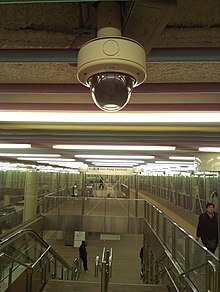 ^ "Metro Plans to Triple Number of Security Cameras". NBC Washington. 1 April 2013. Retrieved 31 October 2015. 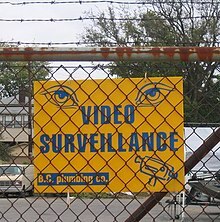 ^ "CCTV Systems". Retrieved 24 February 2017. ^ "PSIRA ACT" (PDF). Private Security Industry Regulatory Authority. 25 February 2002. Retrieved 2016-10-12. ^ Mould, Nick; Regens, James L.; Jensen, Carl J.; Edger, David N. (30 August 2014). "Video surveillance and counterterrorism: the application of suspicious activity recognition in visual surveillance systems to counterterrorism". Journal of Policing, Intelligence and Counter Terrorism. 9 (2): 151–175. doi:10.1080/18335330.2014.940819. ^ "In the Petabyte Age of Surveillance, Software Polices". Popular Mechanics. 10 May 2010. Retrieved 4 January 2017. ^ "Mehr Videoüberwachung gegen Terroristen - WDR aktuell - Sendung - Video - Mediathek - WDR". WDR. 26 October 2016. Retrieved 4 January 2017. ^ "Calls increase for sweeping surveillance after Berlin attack". Deutsche Welle. Retrieved 4 January 2017. ^ Kroener, Inga (2014). CCTV: A Technology Under the Radar?. Ashgate Publishing. ISBN 9781472400963. ^ "Video Surveillance of Public Places: Response Guide No. 4 (2006)". Center for Problem-Oriented Policing. 2006. Retrieved 25 January 2016. ^ Von Silva-Tarouca Larsen, Beatrice (2011). Setting the watch: Privacy and the ethics of CCTV surveillance. Hart Publishing. p. 160. ISBN 978-1849460842. ^ "Your Right to Privacy". American Civil Liberties Union. Retrieved 24 January 2016. ^ "What's Wrong With Public Video Surveillance". American Civil Liberties Union. Retrieved 24 January 2016. ^ Kroener, Inga (2014). CCTV: A Technology Under the Radar?. Ashgate Publishing. p. 110. ISBN 9781472400963. ^ Kroener, Inga (2014). CCTV: A Technology Under the Radar?. Ashgate Publishing. p. 107. ISBN 9781472400963. ^ "Memorandum by A A Adams, BSc, MSc, PhD, LLM, MBCS, CITP School of Systems Engineering". UK Parliament Constitution Committee - Written Evidence. Surveillance: Citizens and the State. January 2007. ^ "Privacy watchdog wants curbs on surveillance". The Telegraph. 1 May 2007. ^ "CCTV, computers and the 'climate of fear'". Evening Standard. 30 April 2007. ^ a b "Majority of UK's CCTV cameras 'are illegal'". The Telegraph. 31 May 2007. ^ "Home surveillance CCTV images may breach data protection laws, ECJ rules". Retrieved 2015-03-11. ^ Lahtinen, Markus (2017). "The perception of surveillance cameras and privacy among the general public in Sweden" (PDF). LUSAX-research group, Lund University School of Economics and Management, Sweden. ^ James Vincent, The Verge. "Artificial Intelligence Is Going To Supercharge Surveillance." 23 January 2018. Retrieved 25 March 2019. ^ 2018 9th International Conference on Information and Communication Systems (ICICS) : 3-5 April, 2018, Jordan University of Science and Technology, Irbid, Jordan. Jordan University of Science & Technology,, Institute of Electrical and Electronics Engineers. Jordan Section,, Institute of Electrical and Electronics Engineers. [Piscataway, New Jersey]. ISBN 9781538643662. OCLC 1037097519. ^ "MATE's Analytics Integrate with Hirsch Security Systems". Archived from the original on 16 February 2009. Retrieved 2011-03-28. ^ "Image Processing Techniques for Video Content Extraction" (PDF). Retrieved 2011-03-28. ^ Todd Lewan (7 July 2007). "Microchips in humans spark privacy debate". USAToday. Retrieved 2012-06-07. ^ "CCTV Systems for a greater future home & business security". CTS Systems Latest News. 28 November 2017. Retrieved 2017-12-19. ^ "MotionJPEG, JPEG2000, H.264 and MPEG-4 compression methods in CCTV". Retrieved 2011-05-01. ^ "CCTV Systems for a greater future home & business security". CTS Systems. 28 November 2017. Retrieved 2017-12-19. ^ "Global value of IP camera sales now close to 50% of CCTV cameras sold, but..."
^ "Dispelling the Top 10 Myths of IP Surveillance" (PDF). Retrieved 30 March 2016. ^ "The City of Chicago's OEMC and IBM Launch Advanced Video Surveillance System". IBM News Room. Retrieved 30 March 2016. ^ Bulkeley, William M. "Chicago's Camera Network Is Everywhere". Wall Street Journal. ISSN 0099-9660. Retrieved 2016-03-30. ^ Sadun, Erica (26 December 2006). Digital Video Essentials: Shoot, Transfer, Edit, Share By Erica Sadun. ISBN 9780470113196. Retrieved 16 October 2013. ^ "Town trials talking CCTV cameras". BBC News. 17 September 2006. ^ "'Talking' CCTV cameras are tested". BBC News. 25 March 2007. ^ "Be Seen and Unseen! Reflectacles are the Sunglasses of the Future". ^ "Reflectacles - Reflective Eyewear and Sunglasses". Kickstarter. Armstrong, Gary, ed. (1999). The maximum surveillance society: the rise of CCTV. Berg (originally, University of Michigan Press). ISBN 9781859732212. Norris, Clive (2003). "From Personal to Digital: CCTV, the panopticon, and the technological mediation of suspicion and social control". In Lyon, David. Surveillance as Social Sorting: Privacy, Risk, and Digital Discrimination. Psychology Press. ISBN 9780415278737. Wikimedia Commons has media related to Closed-circuit television (CCTV).